S. Curtis Hayes, Inc. Insurance and Real Estate is Your full service Real Estate & Vacation Rental Agency servicing the Saranac Lake - Lake Placid section of the Adirondack Mountains. If you can not find what you are looking for, please send us an email, we are sure we can help you find that special home! Please hover over the thumbnails to see another image. Please click on the links or thumbnails to learn more about the listing. 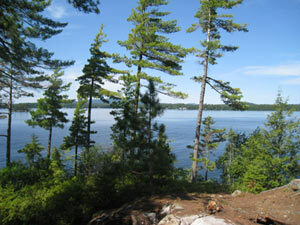 Upper Saranac Lake Vacation Rental - This property is situated at #812 on the Bartlett Carry Road on Upper Saranac Lake. 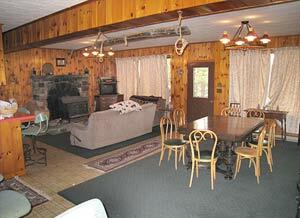 It is a log home with two bedrooms and one full bathroom. It has a dock and sandy swimming area. 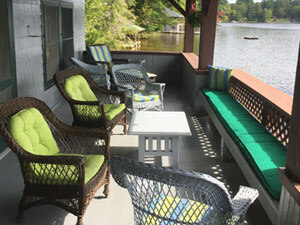 Upper Saranac Lake Vacation Rental - Sit on the large covered porch and enjoy the scenery along with the peace and quiet afforded by this Upper Saranac Lake camp. Swim or paddle around the gem of a lake. Ask about discounts on multiple weeks. Rented Memorial Day through Columbus Day for $1,300 per week. 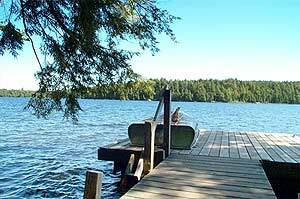 Saranac Lake Vacation Rental - This newer home is located on Lake Flower and has 100' frontage, a small swimming area and a two stall boathouse with second story deck. The home has 4 bedrooms and 3 bathrooms and a great deck to enjoy the view. Upper Saranac Lake Vacation Rental - This new home with sandy swimming area is located in the Saranac Inn part of Upper Saranac Lake. Sit on the covered porch and enjoy the view and privacy. There are 3 bedroom plus a den with futon, a modern kitchen plus living and family rooms for the family to spread out. 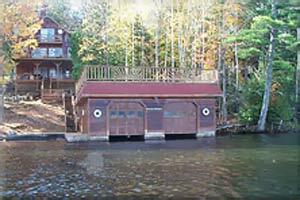 Lower Saranac Lake Vacation Rental - This year round residence has 3 bedrooms and 1.5 bathrooms. 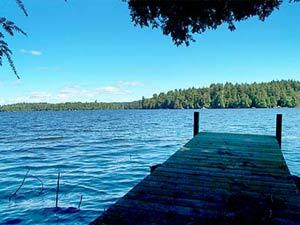 It has a large dock with gorgeous sandy beach facing westerly. Wonderful lakefront property located on the quiet southeast shore of Upper Saranac Lake offering spectacular views and privacy. This Adirondack camp (renovated in 1998) has 4 bedrooms with 2 full baths and a fully equipped modern kitchen complete with a microwave, dishwasher and an outdoor gas grill. Amenities include: A large lake-side sun deck and dock to enjoy the lake by day and an outdoor fire pit to enjoy the stars and loons by night. Large windows offering lake or pond views from each room. Two stocked fish ponds to entertain the kids along with a sandy swimming area. It is Rented from Memorial Day through Columbus Day for $2,950 per week. Upper Saranac Lake Vacation Rental - Enjoy this newly renovated and expanded 3 bedroom main house with a spectacular private setting. 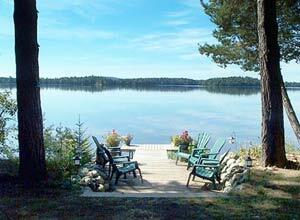 Enjoy the dock, sandy beach and if the family is larger, there are additional sleeping buildings for the larger group. Rented June through September. 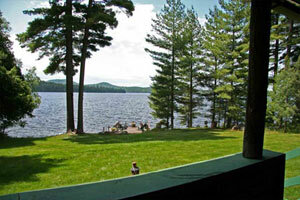 With a view of the Adirondack Mountain range, this camp provides a true Adirondack experience. Four cabins surround a natural garden. The boathouse cabin has a generous porch that has a spectacular view of the lake and mountain range- perfect for entertaining and a sunset cocktail. An outdoor picnic area complete with a fireplace is the perfect place for smores. This camp is filled with charm.